Ohio owes more than it owns. Ohio is a Sinkhole State without enough assets to cover its debt. Elected officials have created a Taxpayer Burden™, which is each taxpayer's share of state bills after its available assets have been tapped. TIA's Taxpayer Burden™ measurement incorporates both assets and liabilities, not just pension debt. Ohio only has $47.4 billion of assets available to pay bills totaling $78.1 billion. Because Ohio doesn't have enough money to pay its bills, it has a $30.7 billion financial hole. 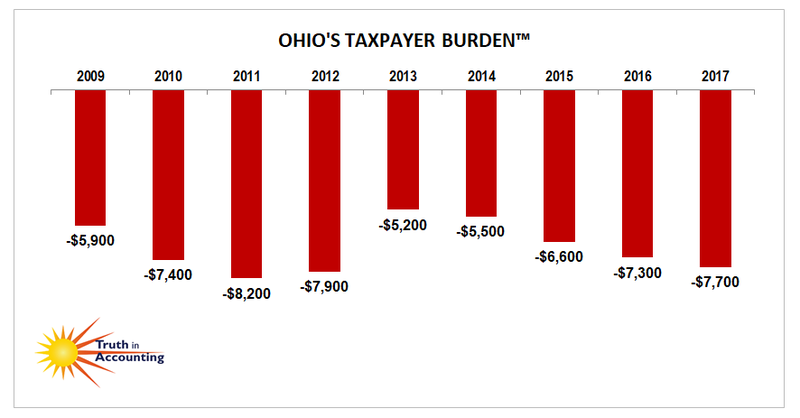 To fill it, each Ohio taxpayer would have to send $7,700 to the state. 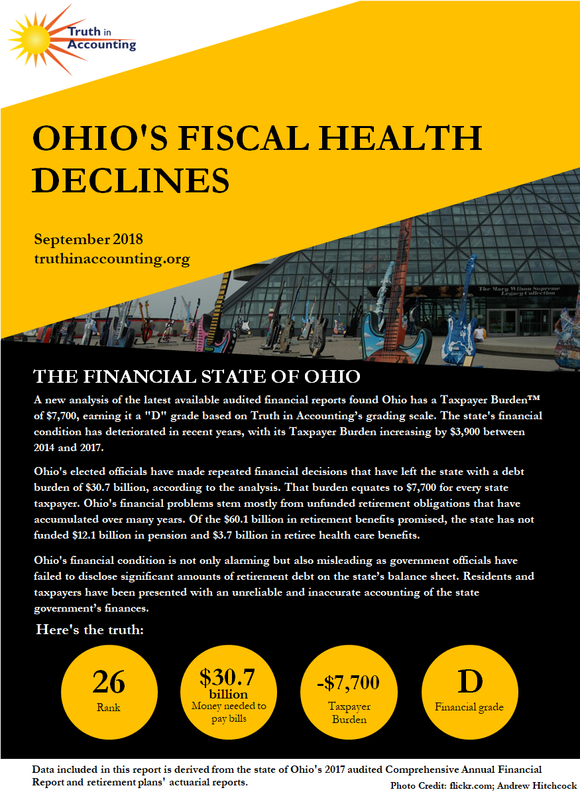 Ohio's reported net position is inflated by $8.3 billion, largely because the state defers recognizing losses incurred when the net pension liability increases. 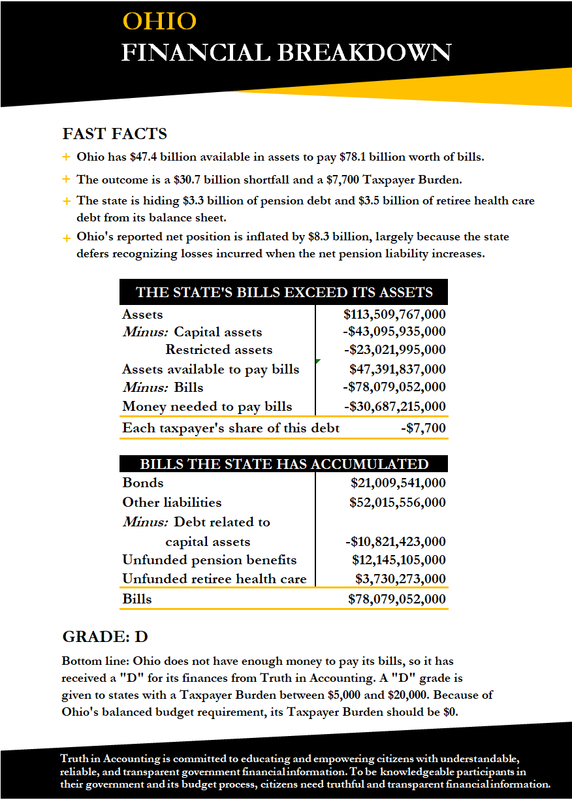 Despite a recently implemented accounting standard meant to increase transparency, Ohio still excludes $3.3 billion of pension debt from its balance sheet. In addition, the state is still hiding $3.5 billion of its retiree health care debt. A new accounting standard will be implemented in the 2018 fiscal year which will require states to report this debt on the balance sheet. The state's financial report was released 175 days after its fiscal year end, which is considered timely according to the 180 day standard. Is federal deficit spending a problem? You bet. But it isn’t our biggest problem yet.